This is a book of 210 reference positions rolled out by the computer program, Snowie. The idea is that by having equities for standard positions you have something to compare with when trying to figure similar positions. Each position is accompanied by commentary explaining what features of the position make it stronger or weaker than other similar positions. This is volume one of a planned two-volume series. It deals with fairly standard types of positions seen every day; positions such as holding games, anchor games, and early blitzes. Volume 2 will deal with more complex and less standard types of positions. "Because of the large number of possible moves at each turn, backgammon does not lend itself to the cataloguing of detailed opening variations in the same way as chess. A backgammon player builds up his knowledge through acquiring a set of reference positions, either by playing or by study. Until now no one has produced a detailed set of common reference positions. "Too skinny! An encyclopedia is supposed to be comprehensive. 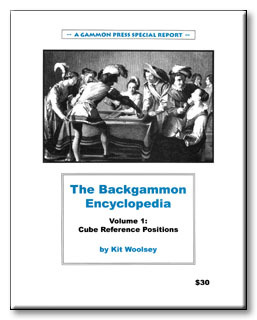 This one discusses 210 backgammon positionshardly room enough for comprehensive treatment of the doubling cube, even if one allows for the projected Volume 2. The book itself is quite a fine and useful piece of work. It consists of nine sets of related positions with Snowie 3 rollout results and commentary for each position. Each set represents a type of position that comes up frequently in practical play. Everyone who plays backgammon with the doubling cube needs to know something about these types.